Just a quick 45-minute flight from Ho Chi Minh City and you will arrive on a beautiful island in the Gulf of Thailand. Here you will find plenty of gorgeous beaches and dense jungle to explore. The island also offers a bit of history, as it was home to the South’s largest prisoner camp in the Vietnam War. So whether you are looking to relax on the beach and get a massage, take in some history, or have an adventure…this island has something for everyone! 1. Vung Bau Resort: This resort is in an isolated location on the Northwest side of the island and took 45 minutes to get to from the airport. It was actually the second place we stayed after leaving Bamboo Cottages– an expensive accommodation option that I cannot recommend. Vung Bau Resort offers a secluded paradise away from the crowds of town. It is a quiet and peaceful place to unwind from a hard day of lounging at the beach and frolicking in the ocean waves! Even though we weren’t far from our previous accommodation, the beach seemed so much nicer…and bigger! There were hammocks and chairs hanging from the trees, along with lounge chairs lining the beach. There was a restaurant on site, that also had great views of the water. The food was good, not great…but there were quite a lot of options to choose from. Not to mention, they greet you with a nice welcome drink upon arrival…the mango smoothies were delicious! The resort offered rooms for all budgets starting at $30 USD…we opted to splurge a bit and went for a beachfront bungalow. It was spacious, clean, and had everything we could possibly need. This room cost us 50 USD and included breakfast. Because we booked this room right on the spot, we paid less than it was listed online. This is the benefit of last minute planning…but then there’s always the chance that rooms will fill up and you’ll be left homeless…soooo it’s a risk lol. The choice is up to you. 2. Paris Bungalows: Centrally located close to the airport and town, while still giving the feeling of solitude right on the beach. We stayed here for 2 nights and really enjoyed our stay. As a guest, you have the option to enjoy the beach or lounge by the pool. For anyone wanting a little bit of luxury while sticking to a budget, this is a great place to start! Because of my poor ability to plan ahead, we ended up having to book the last room available- a superior bungalow for 60 USD a night, including breakfast. However, the rooms at this resort range from 32 USD-150 USD a night and always include breakfast—which was especially good! We enjoyed all the meals that we had at the restaurant. The owners are a Vietnamese, French couple and there is definitely a good French influence in the food. The owners are always in the restaurant lobby area and seemed to genuinely care about their guests’ experiences. This is the perfect place to stay as a base if you want to explore the island. Beach: There are so many to explore, and you may find yourself completely alone on some of them. Sao beach in particular boasts a few restaurants and bars, lounge chairs, as well as Kayak and Jet-ski rentals. Rent a Motorbike: This is the best way to explore all that the island has to offer. We rented one on two separate occasions, both times from our accommodation…heading north one day and south the next. Local resorts provide maps and suggestions for routes on where to go. 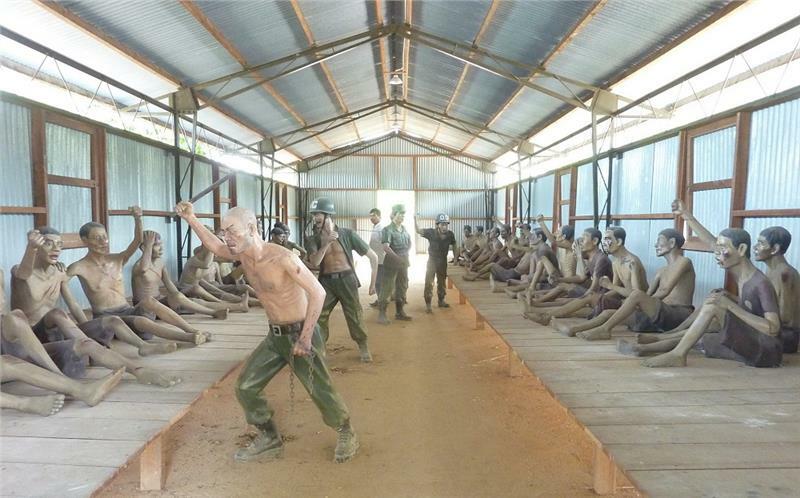 Phu Quoc Prison (also known as the Coconut Tree Prison): This was a very sad eye opener to the conditions and torture that the Northern POW’s went through during the Vietnam War. They have made mannequins to portray horrific situations that are said to have occurred throughout the prison. This is a free attraction and definitely a must-see if you are interested in history. However, be forewarned…some parts are very graphic. Dive the Reefs: We decided not to dive on the island, because we were diving in another location shortly after our visit. However, Phu Quoc offers a variety of reefs to explore and diving companies to choose from. Dinh Cau Night Market: This was a great market where we enjoyed walking around and seeing all the different stalls selling everything from pearl jewelry to Vietnamese souvenirs. 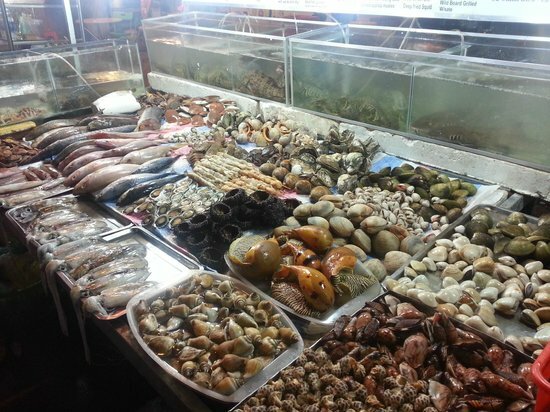 There was also a ton of food to choose from…primarily seafood! You can pick some of your dinner out while it’s still kicking, so you know its super fresh! The fish we had was delicious and it looked like you really couldn’t go wrong with any of the options. I would definitely recommend checking this out.